Thanks for staying at our Stanhope Retreat. Welcome to Stanhope Retreat, our home away from home in country Victoria. This welcome book is intended to help you get acquainted with the area and our home. We have listed some of our favorite restaurants, golf courses, vineyards, and more. Along with our area guide, you'll also find everything you need to know about our home. The address is 27 Stanhope St Daylesford, Victoria Australia. The house is white and has a sign out the front "STANHOPE"
The house is down the hill behind the straw house...there are usually rubbish bins in front of the straw house. If you come down Stanhope St, the street will turn left into Stanley and then you need to make a sharp right down the hill. If you end up in Grenville St you have gone too far. Check-in time is 3:30 pm and Check-out is 10:30 am. On departure, lock the front door, leave the keys on the kitchen table, leave via the back door. Ensure you lock back door on the way out. We are located in a residential community and it's home to many people. As such we ask that you respect their privacy and their right to a peaceful existence! Specifically, between the hours of 9pm and 8am noise should be kept to a minimum. Although we love animals, pets are not allowed in our home. The only exceptions are certified service dogs. This is a non-smoking property. Please do not smoke inside or on the covered patio. Feel free to smoke in the garden and pool area but remember to keep the area clean and free from cigarette butts! 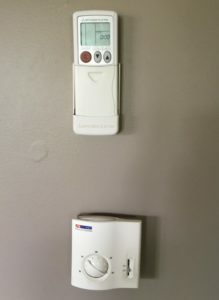 The aircon can be controlled using the remote on the wall in the living room near the front door. We always maintain the temperature at around 71F - 73F and it should not be necessary to adjust it beyond that range. However, if you do need to, you can simply press the up or down arrow on the panel. Please ensure all doors and windows are closed whilst it is running otherwise it will not operate efficiently. The kitchen is kitted out! You'll find, amongst other things, a fridge and freezer, dishwasher, microwave, gas fired cook top, gas oven, cookware, etc. We've included a starter supply of dishwasher tablets and washing up liquid. You'll also find tea towels in the second draw left to the oven.Should you have any questions before (or during) your stay please let us know! To the left of the kitchen is a laundry room with separate washer. There is also a sink and cabinet space in which you'll find a starter stock of detergent and softener. Operation of the units is very simple, with controls for each setting and a start button! The TV Remote controls the television. The is a seperate remote controls the DVD player. To watch a DVD, change the input/source to AV1. We provide a starter pack which includes a roll of paper towels, a roll of toilet paper in the bathroom, a few trash bags, basic cleaning products such as dish soap and dishwasher detergent. In the kitchen, we provide basic spices such as salt and pepper and other commonly used spices. If your cooking style requires something special please bring it! You will need to purchase these supplies for the rest of your stay. The beds have been freshly made up for your stay with towels left on the beds for each person. There are extra blankets in the front bedroom wardrobe. There is an iron plus ironing board and coat hangers. There is a Coles supermarket in the main street. Timber is in the woodshed. While there are plenty of branches around, please bring your own kindling and firelighters to be safe. There is a spare key in the linen box on the deck. Please call me on 0411356699 for the Security number. Check out is 11.30pm. Should you wish to leave later than this please contact us beforehand. If we have guests arriving it will be tricky but we can try! Extinguish the fire in the fireplace and ensure the door is closed. Please travel safely back home and we hope to see you again soon!! We hope you had a lovely stay with us. If you did, then we'd really appreciate it if you could leave us an online review. If you enjoyed your stay and would like to rebook, we offer a 10% discount for repeat bookings. Just let us know! 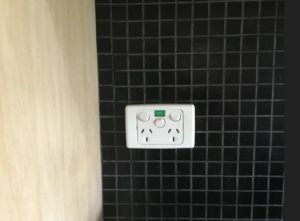 Prior to turning the oven or grill on you need to turn the middle switch on the wall. The oven is gas and the grill is electric. 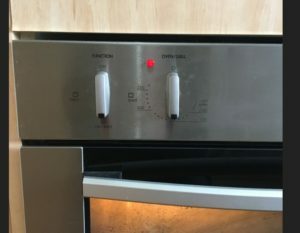 To turn the oven on the 2 dials on the left need to be turned on per the photo. 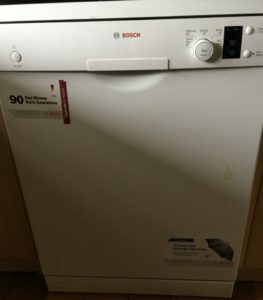 We provide tablets for the dishwasher. Please ensure all dishes are washed and dishwasher is emptied before departure. We provide wood for the fire. We leave it on the deck plus there is a wood shed out the back. Kindling is provided at times but we ask you bring your own to be safe and fire lighters if you require these. Please do not leave newspaper in the bin or the wood boxes please. The top remote is for the cooling system in the house which is in the lounge room. The bottom thermostat is for the central heating. Please ensure all appliances are turned off before departure. If left on you will be charged an additional $50. The coffee machine requires pre-ground coffee. As everyone has different taste we ask you to bring your own. We may supply at times. 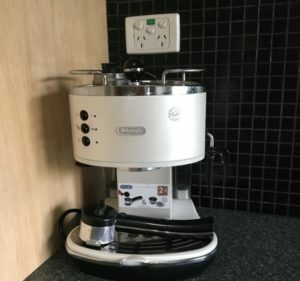 The coffee machine also has a milk frother on the side. Please ensure you empty the water and remove any coffee from the machine before departure. The coffee machine requires ground coffee. We have also supplied a coffee grinder if you wish to bring your own beans and grind them there. 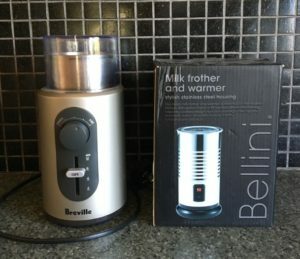 The other is a milk froth, however the machine does have a spout to which you can use. Please note both items are in the cupboard. By booking the property you consent to the following terms and conditions. Deposit of 50% non-refundable is required to secure the booking. Payment of the rental deposit constitutes the clients acceptance of these Terms and Conditions. The balance of the rental amount must be received in full 7 days prior to occupancy. If not the owner has the right to cancel the booking and attempt to re-let it. Cancellation if caused by the client, money paid is not refundable unless the house is re-let for the entire period. If it a refund is made due to the property being relet then a $50 cancellation fee will apply. Parties and Functions are strictly prohibited unless otherwise agreed in writing first and paid for. The price charged is for domestic use only and not commercial. Accordingly, this rate does not allow for the extra wear associated with functions in terms of cleaning, garbage removal, wear and tear, repairs etc. Use contrary to this may result in loss of your bond and/or additional payments. Damage, Breakages, Theft, and Loss are the tenant's responsibility during their stay. The guests providing the credit card details approve the owner to charge $500.00 for any damage caused by the tenant to the provided credit card. Any further cost over and above $500 will also be permitted to be charged to the card by the holder of the credit card provided. In the event, the cost to repair the damage is less than $500.00 the owner will refund the difference. Departure - the property should be left in a similar state to its condition on arrival. Check-out time is 10:30 am, to allow time to prepare the property for next guests. Disturbance to our neighbors, including excessive noise, is prohibited and may result in termination of rental and loss of bond. Pets are not allowed. Please note that Stanhope retreat has a "no shoe in-house policy" so would kindly appreciate if you did not wear shoes inside. Injury - the owners take no responsibility for any personal injury how so ever cause by the tenant. The owner will not be liable for any costs incurred resulting from any form of personal injury. Any damage caused by the client will be charged to the client. 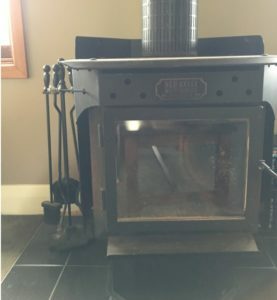 If heating and or cooling is found to be left on the following departure you will be charged a $100.00 fee without dispute or refund. If property left in an untidy state guests will be charged a fee according to the time spent to clean at $40.00 per hour ata minimumm of $80.